Does your phone, laptop or tablet have you confused or frustrated? Want to know how to download and read or listen to books on your phone for free? What is Linkcat and how do I use it to find what I want? 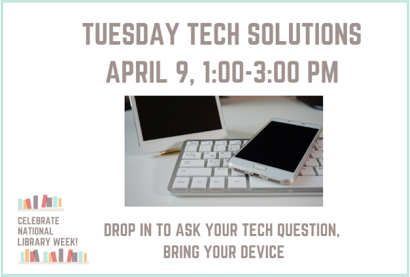 Drop in to see Susan for an individualized 30 minute troubleshooting or informational session. Be sure to bring your logins, user names and passwords with you, along with your fully-charged device. Apple (iOS) users, please also bring your Apple ID.